“Elegant, sparkling, and super chic. Lush, full-bodied, and incredibly realistic looking, the Norway Green Spruce Artificial Christmas Tree is well worth the money. It comes in four different sizes so you can choose the best option for your indoor space, and each size includes a sturdy metal tree stand. It's easily our top choice for overall best artificial Christmas tree. Reviewers agree that this Christmas card-worthy tree is virtually unmatched in terms of quality and design. It has crush-resistant branch tips that are made from real tree branches, so holiday guests will be fooled into thinking it's the real thing. The upswept branch design is perfect for hanging ornaments, and the dark green color looks rich and vibrant. The tree is shipped in sections that require some assembly, but reviewers report that it's easy to put together. 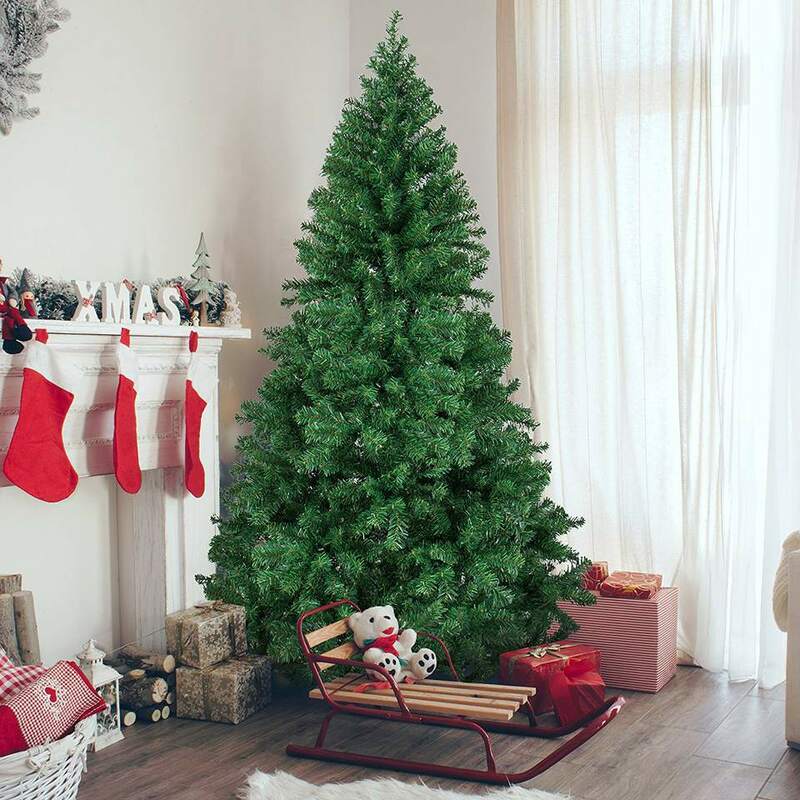 Customers consistently praise the Norway Green Spruce for being full and realistic, and say that it has a “good shape”—just be sure to fluff out the branches. The seven-and-a-half feet hinged tree comes with easy-to-fluff branches. These components are covered in 1,346 tips to make them look full bodied and genuine. Plus, it contains the classic silhouette that looks timeless in just about any setting. Beyond its look, buyers love how easy it is to assemble the three-piece tree. Several were skeptical to invest in an online artificial option, but once they put some effort into plumping out the branches, they were blown away by the quality and design of it. Consider it a great option to go with if you want a standard tree you can completely deck out for the holidays. Over 1,000 reviews, a four-star rating and a best seller label make this a standout product in the artificial tree category. Backed by an eye-catching design, and an even better price point, this six-foot stunner earns top marks from us. The artificial pine features lusciously full branches—1000 tips in total—to create the look of a genuine tree. And the sturdy metal base helps keep it standing tall throughout the entire season. When the festivities are over, the tree’s hinged body easily disassembles into three pieces and can be placed in a Christmas tree bag for effortless storing. Measuring 72” x 55" x 6’, it’ll look great in any apartment, condo or bedroom that’s in need of an option slightly smaller than a standard-sized tree. Customers consider this pick a steal. For under $50, they love the beautiful look and feel it provides. Plus, they claim it has the easiest set-up ever. Seem too good to be true? Take a look at the reviews to understand why buyers are favoring this best seller. When it comes to filling your space for the holidays, there’s nothing more wonderful than a big—and beautiful—tree. When it comes to finding a sizable option, the National Tree Company brings you a Dunhill Fir Tree that ranks highest in the large tree category. Their nine foot beauty contains a classic full shape, made with tips comprised of True Needle—a technology that uses molded plastic to mirror the look and feel of genuine tree branches. The pre-strung lights have nine different colors and actions, so you can choose the best option for your home. This tree also includes a sturdy metal stand that folds up for your convenience. Reviewers write that you do have to separate and fluff each stem to ensure that your tree has a full appearance—it won't look like the pictures right out of the box. The fluffing and shaping instructions are provided in the instruction booklet. Additionally, this choice comes pre-lit with 900 LED lights and backed by a 3-year lights warranty and 5-year tree warranty. Given its high price tag, it’s comforting to know your investment is backed by an extra guarantee. Pricing and all, it still comes highly recommended by those who made the splurge on this bountiful option. Here’s another front-runner that boasts many amazing qualities, though it does have a higher price point than other options on this list. The National Christmas Tree Jersey Fraser Fir is pre-lit, unlike the first option, and comes with a realistic fraser fir disposition. It runs much larger—nine feet tall to be exact—which contributes to the high cost. Despite these differences, users swoon over its stylish and life-like design, making it a home favorite for all. The tree has an authentic look thanks to the branch tip technology that works to give it some realistic features. The branch tips are crush-resistant, so you’re guaranteed a full-bodied tree right when you take it out of the box. For added flair, it’s pre-strung with 1500 clear lights that are resistant to bulb burnouts—which is a big decorating plus. Then, once the season’s over, the hinged branches disseminate into four sections, while the stand easily folds away. You’d never guess a 9' x 6.5' x 6.5'' tree would have a takedown so easy. The most talked about asset of the tree among reviewers is how beautiful and full it looks. 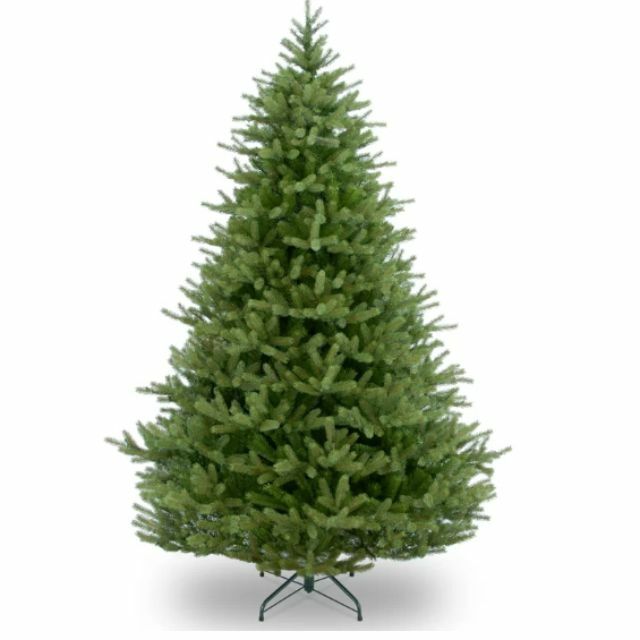 So for those taking a first stab at an artifical option—and have the space to fit a big one—this fraser fir should be held in high consideration. Pre-lit trees can be a real time saver as you don’t have to wrestle with stringing strands and attempting to get them all evenly spaced. With a pre-lit artificial option, you just plug it in, and voila! This pre-lit tree from National Tree stands 7.5 feet tall, is 58 inches around, and comes with 750 lights. No matter the room you place it in, it's prepped to make a big impact. Can’t decide if you’re more of a white or colorful light kind of family? You don’t have to choose. This tree comes with both, and you can change between the two with an easy-to-use foot control as often as you like. There are more than 1,899 branch tips in all, and they feature the company's Feel-Real technology which molds them from actual tree branches. Customers note that the tree is high quality and the lights are bright and lovely. While some say it takes a bit of time to set up and fluff, once you do it makes a stunning sight during the holidays. Just because space is limited doesn’t mean you can’t still put up a Christmas tree that will make a big, festive splash. Though it be little, this tree from Nearly Natural is mighty pretty. It stands just three feet high and 21 inches wide, so it can fit nicely in a small corner or even on a tabletop. It’s also a great tree to put in a kid’s bedroom. Best of all, it’s already decked out with lights—100 of them, to be specific—so you don’t have to worry about stringing them. Just plug it in and watch it glow. The lights are also designed so that if one goes out, the rest of them keeping on working—which is huge a relief if you’ve ever dealt with Christmas tree lights without that feature. The tree is made of more than 130 faux pine tips and is also peppered with pine cones for a rustic feel so realistic people might just mistake it for a real one. Customers say the tree is well made, easy to set up, and really adds Christmas spirit to their small space. Want to take the hassle out of tree trimming? Go with this Frosted Berry Pine tree from Wayfair. We promise: It’ll look good even without adding a single touch. Clad with 250 clear lights, built-in berries, grapevine twigs and pinecones, it delivers an elegant pine design that looks like it belongs outside. Plus, the frosting on each of the branches adds an authentic extra touch. At seven feet high, this decorative accent falls within the constraints of a standard tree. However, the reviews do suggest it runs slightly slimmer than expected. That said, the commentary consistently speaks to the high-quality, which is far above expectations given the price. With free shipping and a 30-day return policy, you have nothing to lose going with an artificial option that mirrors something straight out of nature. Everything looks prettier in pink—even your Christmas tree! For an unconventional take on this holiday staple, this glistening pink tree will be a welcome addition to your home. It stands six feet tall and has 1,477 PVC branch tips that give it a full and realistic appearance. Storing this gorgeous decoration is easy thanks to the hinged design and foldable stand. Reviewers say that the price is just right and it's easy to assemble. If you’re looking to stand out from the crowd this year, this bubblegum beauty deserves your full attention. Dreaming of a white Christmas? Now is your chance to ensure you've got some white on Christmas Day with this 8-foot tree. With 1150 PVC tips you'll be sure to have a full tree. A heavy-duty metal stand ensures it stays upright and safe all December long, while the hinged branches make for easy set-up and storage. For an extra-stylized touch, hang one color of ornaments this year (perhaps pink or red) for a super trendy and fashion forward tree you'll remember for years to come. When you’ve got heavy decorating to do, this Carolina Pine from National Tree is down for the job. This tree is no lightweight—coming in at a mighty 59 pounds—but that means it’s strong and sturdy enough to hold all your trimmings. You don’t have to worry about sagging branches or heavy ornaments slipping off and crashing to the floor, this is a tree that’s meant to hold it all. The tree measures 7.5-feet tall and is 59 inches in diameter. It’s pre-strung with 750 clear lights covering its 1,393 branch tips. It all comes together with metal hinges, and it’s both flame-resistant and non-allergenic. It’s also peppered with pinecones for a straight out-of-the-woods vibe. For those who love the look of crisp, freshly fallen snow, the Pre-Lit LED Flocked Mixed Pine Tree with 500 Warm White Lights from Home Accents Holiday is a superb choice for your home Christmas tree. The tree’s soft, glowy lights and snow-frosted branches evoke a peaceful, wintry forest landscape—suffusing your living room with a cozy and warm ambiance, just in time for the holiday season. This towering 7.5-foot tree boasts a very lifelike appearance, with 1586 artificial branch tips that round out its full shape. Just be sure to fluff the tree for the most realistic appearance. Elegant, sparkling, and super chic, the Pre-Lit LED Flocked Mixed Pine Tree is a snow-kissed Christmas staple. We bought three top-rated artificial Christmas trees and our reviewers tested them daily for weeks on end during the holiday season. We asked our testers to consider the most important features when using these artificial trees, from their size to their style. We’ve outlined the key takeaways here so that you, too, know what to look for when shopping. Size Naturally, you’re going to want to consider the size of the artificial tree you buy in relation to where you plan to put it. Think about its height and width, as well — there are slim trees available that’ll take up less space in tight rooms. Don’t forget to consider storage, too; the larger the tree, the more room it’ll take up in storage the rest of the year. Style Artificial Christmas trees come in many styles. There are realistic faux trees that could pass for real plants, as well as “frosted” trees that look like they have snow on them. On the other end of the spectrum, you can get pink, silver, or other colored Christmas trees that make a bold statement during the holidays. It all depends on your personal style. Lights You’ll likely come across many pre-lit artificial Christmas trees, which have built-in lights spread throughout their branches. This can save you a lot of time when it comes to decorating, but some people still prefer to use their own strings of Christmas lights on an undecorated artificial tree. “The overall shape and color of this tree was very natural,” declared one of our testers. “It's full without looking artificially fluffy and asymmetrical in the right places!” One reviewer also said that the base is “light but feels secure, which is especially important in a house with a cat.” The fluffing process, however, was very time-consuming, according to one of our testers: “It took two of us about two hours to get it into a shape we were somewhat satisfied with, and it easily could've taken two more.” One reviewer also noted that its needles were fairly sharp, so he opted to use gloves to avoid scratches. One of our testers was “pleasantly surprised” about how easy this tree was to assemble, as well as how natural it looked: “The overall appearance is really pleasing,” she said. “I'm used to real trees, so I was afraid I'd be bothered by the look of an artificial one. But once it was up and fully decorated, it really didn’t feel fake.” One reviewer also liked that its branches were flexible, which made it “easy to move them to where they were needed for ornaments.” On the other hand, one of our testers thought that the tree’s base wasn’t very attractive: “The screws that fasten the tree to the base are silver, which really stick out against the green tree/black stand,” she said. One reviewer also noted that a few needles came off during assembly.